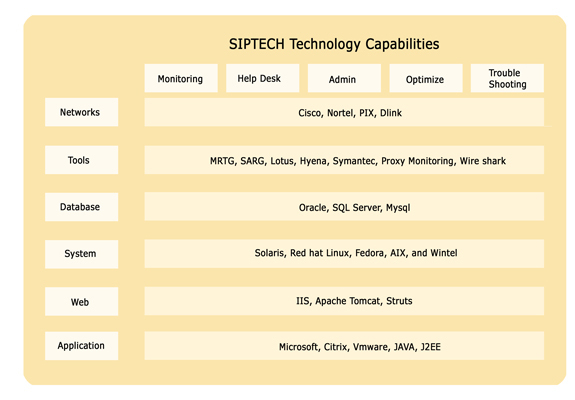 SIPTECH has world class infrastructure to support software development, testing and maintenance services. SIPTECH's datacenter has been built with high availability and redundancy which hosts servers like IBM, SUN and Intel based. SIPTECH Solutions Limited understands how critical the IT infrastructure is to the smooth functioning of your business and we make it our job to ensure that it runs smoothly and efficiently. Our infrastructure management teams provide dedicated 24x7 support to ensure uninterrupted client connectivity and seamless engagement execution across locations. In keeping with the clients concerns on the IP and information security, different types of physical and access restrictions have been imposed within the development center so that our clients can be absolutely certain that their data, systems and processes and other confidential information, including IPRs(Intellectual Property Rights) do not get circulated, inadvertently or on purpose. In order to ensure a level of readiness to maintain the continuity of its critical business and services to customers, SIPTECH has put together a business continuity management framework, which encompasses its key functions, projects and systems. SIPTECH has made sustained investments in developing and implementing an effective business contingency plan, along with mitigation measures for recovery of IT infrastructure and operations, in the event of a disaster. Along with the preparation of BCP and DR plans, regular disaster recovery trials and mock drills are carried out across all customer projects. Backup copies of essential business data and software are taken regularly and stored offsite.